From Skelton Crew Studio. 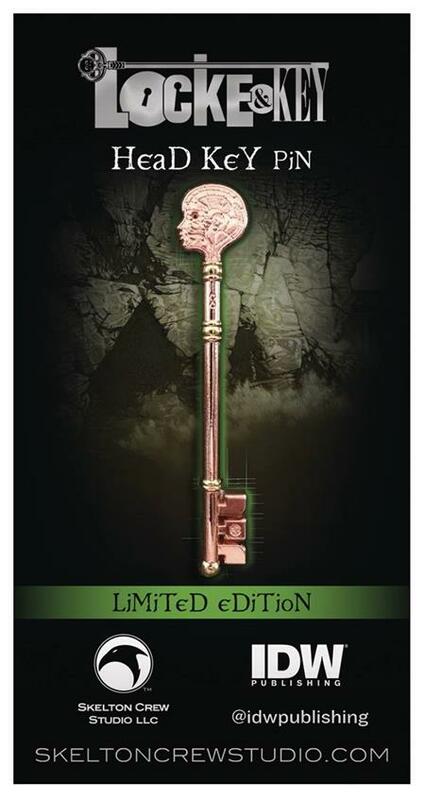 The Limited Edition Head Key pin is straight out of the pages of Joe Hill and Gabriel Rodriguez's amazing Locke & Key published by IDW, and soon be a series on Netflix. This striking, officially licensed pin measure approx. 2.2-inches long. This intricate 3D pin is two-tone plated in rose and yellow gold and mounted on a custom backboard featuring Rodriguez's work. Each has two pinbacks to keep it solidly in place: there's no suddenly finding your Head upside down.